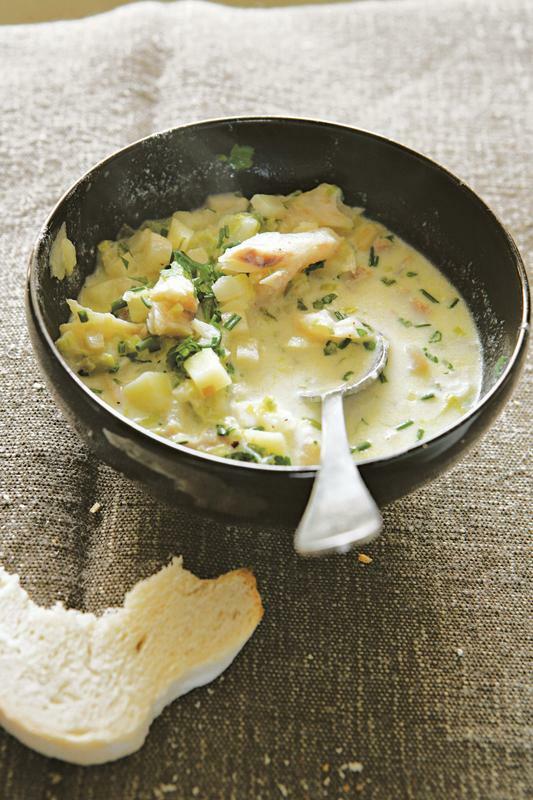 This soup combines all the classic elements of a chowder: a milky base, potatoes and chunks of fish. Celeriac, which is a very fish-friendly root, adds another dimension. Smoked pollack, which we call ‘smollack’ at River Cottage, is a favourite ingredient. Kippers will also work well, though they have a stronger, oilier flavour. Put the smoked fish in a pan and add the milk, bay leaf and parsley stalks. Place over a low heat. As soon as the milk comes to a simmer, switch off the heat and cover the pan. The fish will carry on cooking in the hot milk. After about 5 minutes, it should be just cooked through; if not, leave it in the hot milk for a little longer, then drain in a sieve placed over a bowl, reserving the milk. Discard the bay leaf and parsley stalks. Heat the butter in a large, heavy-based pan, add the leeks, cover and sweat for about 5 minutes. Stir in the potatoes and celeriac, then add the warm, fishy milk. Bring to a simmer and cook gently for about 10 minutes, until the vegetables are tender. Meanwhile, flake the fish into smallish pieces, removing the skin and any bones. Stir the fish back into the soup and season to taste, being generous with the pepper. Ladle into deep bowls, scatter over the chopped parsley and chives, then serve.